Wayne Kimball’s boxes on exhibit at the B.F. Larsen Gallery. Professors may retire, artists don’t. For Wayne Kimball, a former professor of printmaking at Brigham Young University, the post-university years have been a flourishing period of artistic creativity. 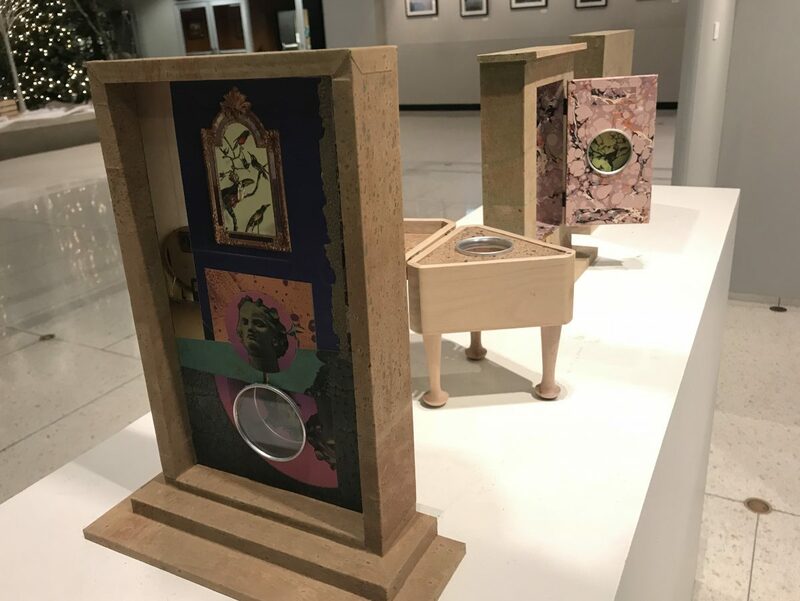 Pressing On, an exhibition of his most recent prints, collages, and boxes, on exhibit through Dec. 12 at his old haunt, BYU’s Harris Fine Arts Center, demonstrates what can happen when an artist is released from the responsibility of classes, grades, and committees and allowed to play full time in his studio. To remark on the fruitfulness of Kimball’s post-teaching years is not to suggest he was coasting for the three decades he worked as a professor. He came into the profession after becoming a certified Tamarind Master Printer in lithography and over the course of his professional career Kimball garnered a national reputation for his lush prints that combine detailed surfaces with realistic drawing in works that maintain a dreamlike quality. These works appear in collections in all of the 50 states, as well as the Smithsonian. 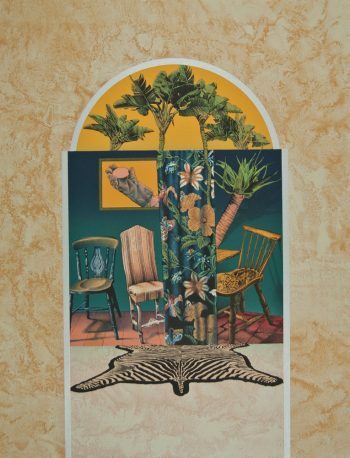 Kimball has acknowledged a Dadaist quality in his prints, as images are brought together from disparate sources — trips abroad, photos from magazines, his own imagination — and combined in a semiotic play of odd associations. Over the years, he has established a familiar repertoire of images: a catalog of birds — from finches and pigeons to egrets and flamingos — worthy of an Audubon; a similar variety of chairs and botanical specimens; ancient statuary of the Ozymandias sort — reminders of past glories and lost civilizations; and the pedestals, drapes and curtains that form his stage settings. This visual vocabulary coalesces into scenes embodying a certain world from the 19th century (also the heyday of lithography): flora and fauna collected from across the globe by intrepid explorers; the amassing of ancient statuary and artifacts into stately public museums; the handmade furniture and accessories of a world of ease. They evoke an age of knowledge and discovery, of a provisionary rather than systematic manner, the evolution of the Renaissance cabinet of curiosities that by the Victorian age had come to fill salons and living rooms. In Pressing On, Kimball’s vocabulary and visual idioms remain the same, though the lithographs he is best known for take a back seat to the dominant presence of his collages and boxes. In the latter, the stage settings that were always present in his images become three-dimensional, literally opening up to reveal a new layer or compartment showing a colossal wreck, crowned fowl or silky palm. 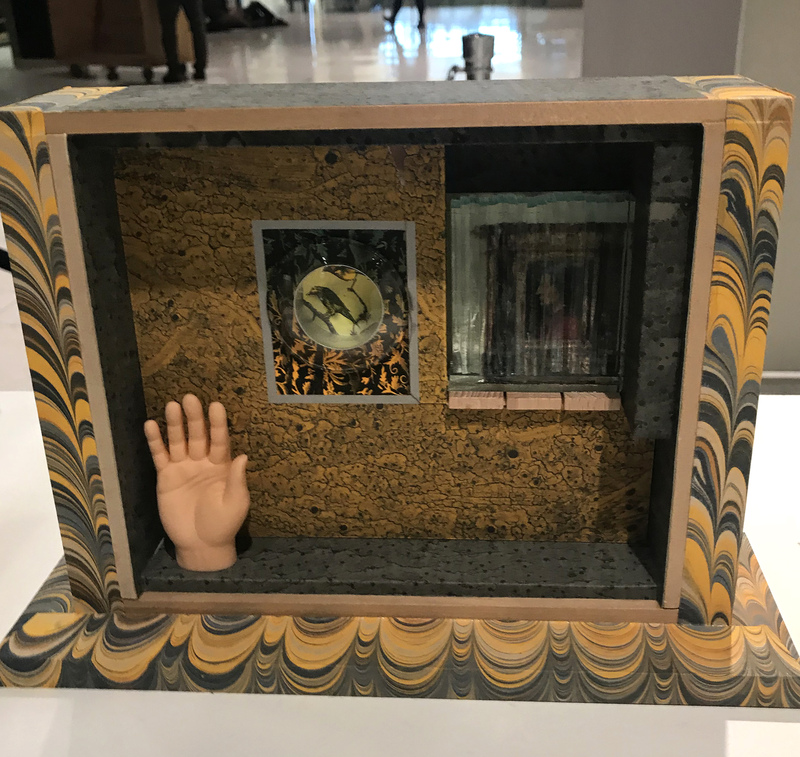 Compartments and divisions sometimes appear in his collage work as well, where it feels as if he has raided his drawers of source material and turned them into original works. That his prints were always pieced together from individual sources was apparent in his recurring motifs, like the zebra skin rug or broken Babylonian statue that reappear in different pieces. And the ubiquity of digital media may have inured us to the handmade mastery Kimball displays in these prints, the flawless combination of realistic visual motifs. These collages show the seams his prints so flawlessly hid as the light glints off a paper’s edge. 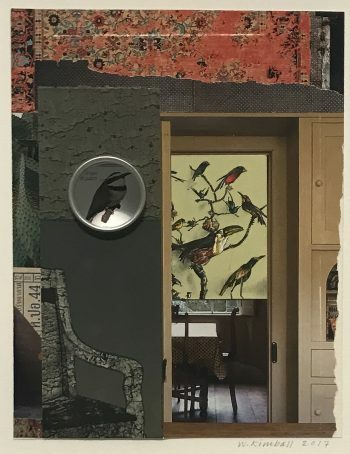 The images of window frames, chairs and bestiaries, sourced from a variety of magazines and books, now appear as themselves, cropped and collaged into compositions similar to those in his lithographs, though rawer. Since his retirement in 2009, Kimball has exhibited regularly in Utah. These boxes and collages are a wonderful amplification of Kimball’s work. It’s not unreasonable to wonder if these new directions are spurred by a sense of artistic freedom, the artist allowed finally to devote all his time to his practice, or of physical necessity: lithography, with its use of heavy stones can be laborious and complicated — Kimball has said it can take him up to a year to finish a print. It could easily be both. Kimball is used to taking whatever life presents and combining it to see what happens. Let’s hope he continues to do so for many years to come. 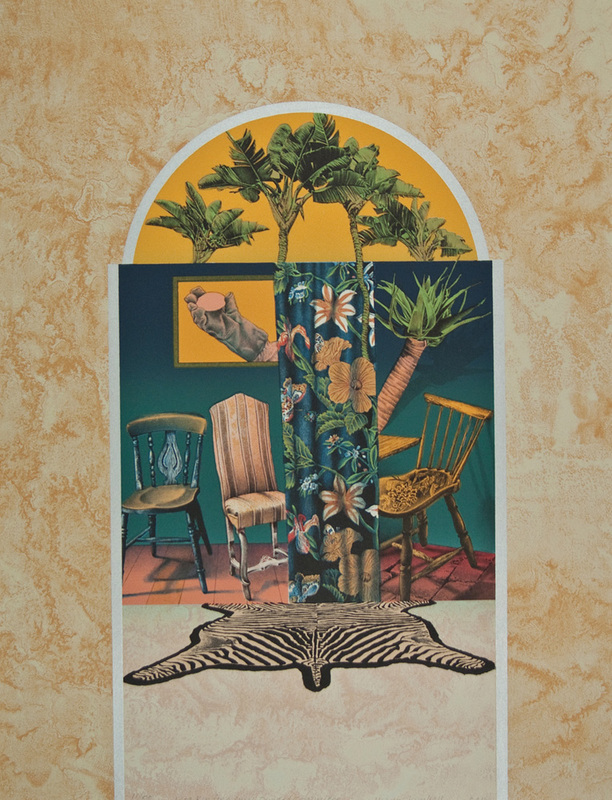 “Pressing On,” work by Wayne Kimball, B.F. Larsen Gallery, Harris Fine Arts Center, BYU, Provo, through Dec. 12.